Hearing of the tragedy, Supreme Master Ching Hai pledged US$80,000, while conveying Her deep sorrow and prayers. Our Association members around the world also contributed a total of US$100,000. Very quickly, our local Gunma and Tokyo fellow initiates formed relief teams. Further assistance came from our Formosan Association members as they arrived in Tokyo, with our Korea team on standby ready to procure emergency items on notice and to continue the relief work when the Formosa team returned home. 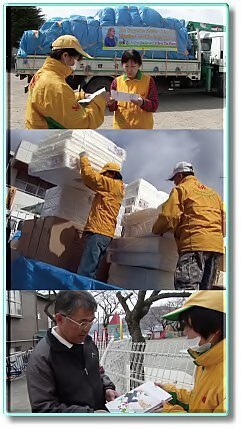 On the early morning of March 15, Association members from the Gunma Center arrived in Mito, Ibaraki Prefecture with water and other relief supplies, which they distributed with SOS flyers. The life of the local citizens was disrupted due to the collapse of roads and buildings as well as utility outages. They also shared Master’s book, The Dogs in My Life, with them and tried their best to fill the hearts of the distressed citizens with hope and optimism. On March 16, the Formosan relief team joined Gunma team and traveled north to the worst-hit areas in Iwate Prefecture. They were given permission from the government as the first NGO to enter the disaster areas, upon presenting their Swiftwater Rescue certification from the International Rescue Instructors Authority (IRIA). Their first stop was the city of Rikuzentakata, where more than 2,000 people were reported to have lost their lives or were missing. Over 70 percent of the houses were destroyed and about 10,000 people had taken refuge in government shelters that supplied food and water provided by the neighboring communities. Mayor Futoshi Toba, who lost his wife in the tsunami, set aside his personal tragedy to coordinate efforts in bringing comfort to his people. Mr. Shirakawa, Chief of the General Affairs Department, Rikuzentakata city, prepared a list of items that were very much needed by the relocated people. Accordingly, our Tokyo relief team purchased the supplies which included underwear, slippers and personal hygiene items. They were delivered to Rikuzentakata on March 18, a nine-hour journey, by our Formosan and Japanese teams. The Korea relief team also shipped supplies by air. Our Association’s timely response earned much gratitude from Mr. Shirakawa, who was deeply touched by Master’s generosity and concern for the Japanese people. Thank you and bless you for being so kind to the vulnerable. My heart is a little comforted knowing you are there to render love and shared sorrow. Please know that my prayers are with you and the good people of Japan. As more roads were cleared, the joint relief team headed to Otsuchi, another hard-hit coastal town in Iwate Prefecture, where citizens had lost all their possessions to the tsunami. Mr. Okamoto from the Disaster Countermeasures Center requested clothing, diapers and other items on behalf of the affected people. Working efficiently, our relief team managed to deliver the essential items into the hands of the people on March 24. In Ofunato, there was a wide-spread true story about the president of a plywood company who sacrificed his life to save his employees. When the tsunami was approaching, he ordered his 140 employees to flee towards the mountains, while he himself patrolled the premises to make sure that no one was left behind. Sadly he lost life to the raging waters. The relief team was deeply touched by the noble spirit of the Japanese people which shines in such times of trouble. On April 4, the relief team from Korea returned to Ofunato with more supplies of rice, clothes, blankets and other essentials packed together with SOS flyers. These requested items were delivered to the Akasaki warehouse and a shelter at Kamaici Commercial High School, along with 80 copies of The Dogs in My Life. In response to receiving the relief materials, Mr. Shida said, “This place is very blessed among many affected areas.” He expressed his support for the idea of stopping global warming through the vegan diet and decided to help promote this message to all the local citizens. The small city of Iwanuma has the tradition of gifting illustrated books to infants when they reach eight months. Responding to a special request, our local Association members and those from Formosa drove through muddy roads to deliver 100 copies of The Dogs in My Life to the Mayor of Iwanuma, Mr. Tsuneaki Iguchi, and Mr. Hirai Mitsuaki, Chief of the Disaster Prevention Section. Both officials and the young children were delighted with Master’s special gift of love. 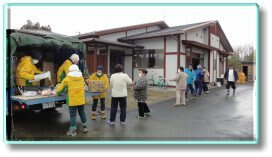 On March 24, our Gunma relief team drove through the night to delivered food, medicine and hygiene supplies to the citizens in Hashikami. Warm clothing and oil heaters were especially appreciated as the weather remained cold. When children received The Dogs in My Life, their faces lit up and their eyes sparkled. 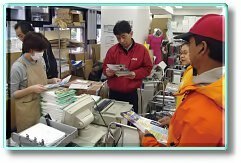 The relief team also provided an ample supply of Japanese food and seasonings together with the books to a senior citizens home that had been turned into a temporary shelter in Kesennuma. On March 28, braving the heavy snow, our Gunma relief team arrived in Minamisanriku, a resort town that had lost most of its houses and half its population to the tsunami. Though still grieving the loss of their loved ones, the people thanked the team for bringing medicine, warm socks and heat packs, which were especially appreciated by the elderly under the dire circumstances. Seaweed toppings that were a regular addition to plain rice were welcomed as a delightful luxury. In spite of the challenging situation, people at all three of the shelters visited by the team considered The Dogs in My Life the very best gift from Master. Next, the Gunma team made a 12-hour journey to Ishinomaki, a town that had been submerged when the Kitakami River breached its banks under the onslaught of the tsunami. As in other communities, citizens here were trying to establish a normal routine in their temporary homes. Warm and sanitary items were highly appreciated, as were the SOS flyers and Master’s spiritual sample booklets. People thanked Association members for their thoughtfulness in bringing band-aids, fever-cooling pads and common cold medicine, as well as vegan food for dogs, many of which had gone hungry for days. 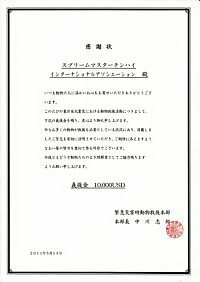 In May, the team also sent US$10,000 to The Emergency Disaster Animal Relief Headquarters in Tokyo. Let’s pray that with God’s love and blessing, the distressful situation eases for all those affected and that such extreme disasters are minimized through our conscientious efforts to care for all beings. 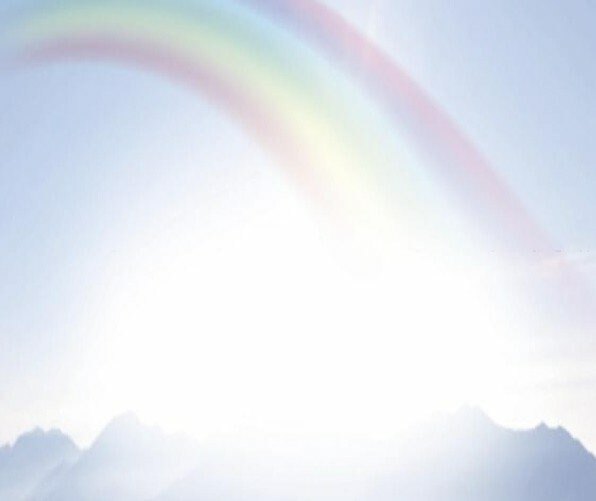 May the noble and generous Japanese soon recover from the disaster to rebuild their lives on the foundation of lasting peace, love and harmony with nature.